Crimson Trace announced that the $50 consumer direct rebate on select Crimson Trace laser sights will continue through April 30, 2019. The Crimson Trace laser sights eligible for the rebate under this offer must be purchased between March 1, 2019 and April 30, 2019. “The Bergara Experience” is an opportunity for the public to come out and experience shooting a variety of Bergara rifles. The first event of the year will be held at Manatee Gun Range in Myakka City, Florida, May 4th. Sturm, Ruger & Company, Inc. (NYSE-RGR) reintroduced the Hawkeye Alaskan rifle chambered in three calibers: .375 Ruger, .338 Winchester Magnum and .300 Winchester Magnum. Based on the popular Ruger Guide Gun platform, this is a stainless steel rifle, paired with a Hogue OverMolded stock. Walther Arms, Inc. is proud to announce the newest variations of PPQ series: the Q4 Tac M1 and Q5 Match M1. The new M1 models sport the same signature features as their M2 counterparts but are now being offered with the M1 paddle-style ambidextrous magazine release. Smith & Wesson Corp. announced that it has contributed over $32,000 to the Pioneer Valley USO. Proceeds raised from the company’s annual Game Dinner have benefitted the Pioneer Valley USO and its programs supporting American military personnel and their families. The April/May 2019 issue of Tactical Life magazine covers the 2019 SHOT Show, featuring the latest and greatest products from the event. Products include optics, shotguns, sound suppressors and more. The National Shooting Sports Foundation and Orchid Advisors are pleased to announce that RSR Group and Silencer Shop will be the Gold sponsors of the 2019 Firearms Industry Compliance Conference. As the new gun models get more plentiful, the names get longer and more cluttered with initials. 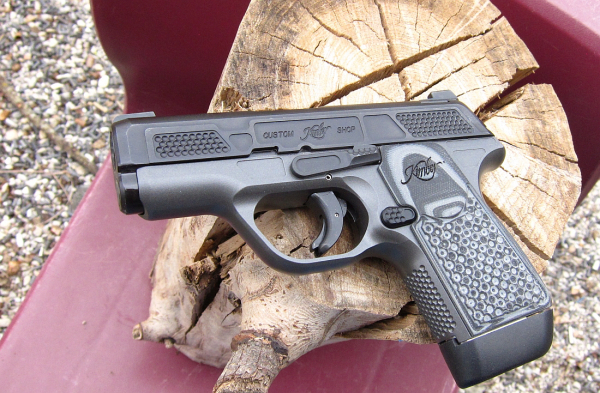 Here we have the eminently classy, but very small, Kimber EVO SP. The “SP,” I’m told stands for “Striker Pistol,” meaning “striker fired” pistol. And what a pistol this is; instead of going for the cost-cutting nature of polymer technology which additionally cuts weight, Kimber went for class; they use aluminum alloy for the little pistol’s frame. The stocks are fitted without external hardware, the magazine release button is reversible and there’s a striker indicator aft, through the slide cover plate. Of what relevance is a striker indicator? You can see if the trigger is forward, right? – Sure you can. If there’s enough light. On this gun, you can run your thumb over the back of the slide and feel the protrusion. That’s smart. The muzzle is nicely beveled. This “(CS)” – Custom Shop – model has night sights on board and they are nice. The front sight has an orange ring around the tritium insert, the rear sight has a generous “U” notch and it features a “ledge.” This flat front can help in one-handed slide manipulations should an unhappy situation occur where two hands were unavailable. The trigger is alleged to be in the six-to-seven pounds range. I confess I’ve yet to check it – it feels much lighter. The Custom Shop model has the TRUGLO TritiumPro sights mentioned above, a pair of seven-round magazines and some interesting slide serrations and lightening cuts. The great thing is that none of the slide cuts are through-and-through, but simply appear as depressions in the metal. The stipple pattern used for grasping serrations on the slide as well as on the front strap and on the G10 stocks and back panel are reminiscent of a golf ball; round indentions. There's not much gun to hang onto as it's being fired. Winchester bulk pack 115 gr. FMJ is light ammo, but you know when it's being launched from the EVO. Using a support bag and a seated rest, the EVO shot the range ammo just fine (below). The pint-sized cannon showed up just in time for a minor break in the unseasonably bad weather. The feel of the gun, a characteristic many people sneer at, is remarkable. I spent time wondering what it reminded me of and I did a little more research. Did the Kimber engineers intend to make an updated version of an old classic in terms of feel? I don’t know, but it seems that they couldn’t have gotten much closer if they’d tried. 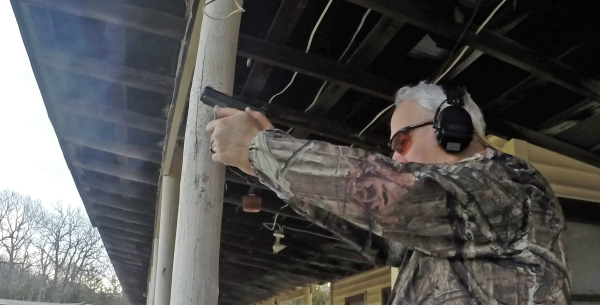 Shooting the Kimber EVO SP (CS) was interesting too. There’s not very much gun here for the caliber. 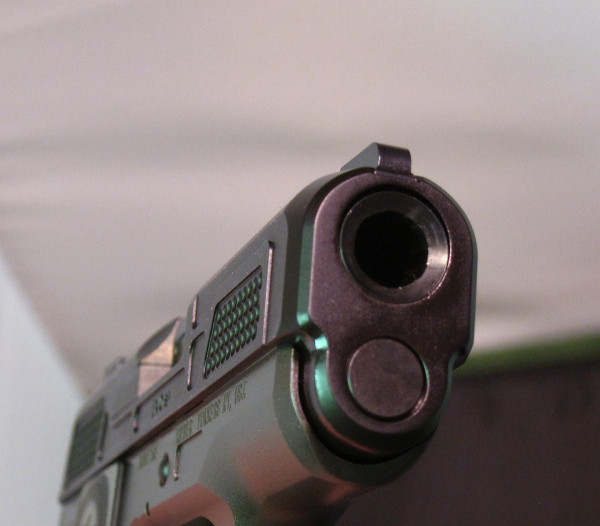 In firing, I find that my small finger slides under the magazine extension as the gun recoils. There it stays and the gun doesn’t slide down anymore as the gun is fired for subsequent shots. In the initial outing, I shot about half a box of WW “White Box” 115 FMJ. The only “stoppage” was a failure to lock open on an empty magazine. It happened only once and well could’ve been shooter-induced. Shooting from a base rest at 25 yards with WWB, I found the point of impact was an inch high and 3.25” left of aiming point. Five rounds went into 4.5” with the best three clustering into 1.25”. I felt that grip was the biggest reason for the group – Did I mention that it’s not very much gun to hold onto? Winchester bulk-packed “white box” is one of the lightest loads I know. It was still “sporty” in the EVO, but not painfully so. The gun wants to squirm more than kick. The superior stocks and grip surface treatment keeps it as steady as you can keep such a small heater. 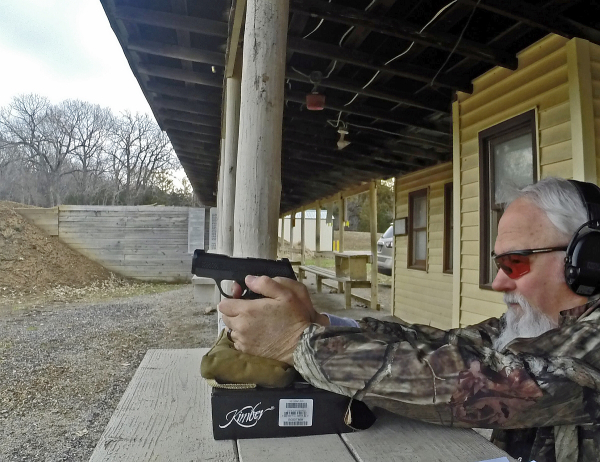 I hope to get to run this little gun a bit more and get it into the hands of some other shooters for their evaluation – and I’ll keep you posted on the results.